Welcome to Day 12 of the Adjustable Shawls series! 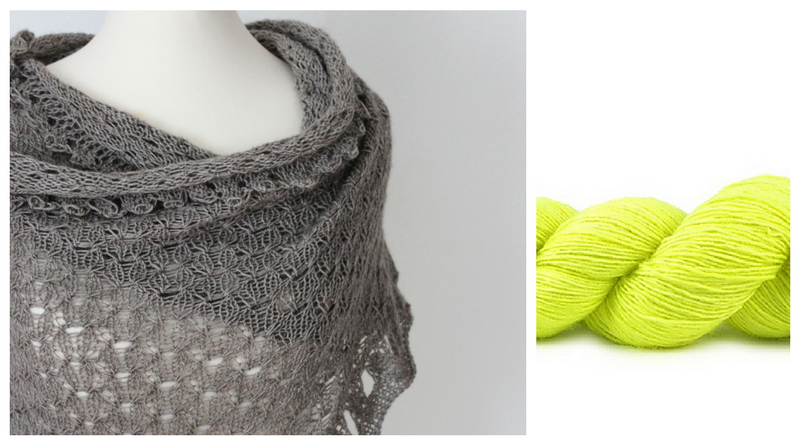 Today, we’re talking about resizing shawl knitting patterns to fit our size and shape. How does resizing shawl knitting patterns work for existing patterns? The first step in converting existing shawl patterns into adjustable ones is to find out the underlying basic shape of the shawl pattern in consideration. 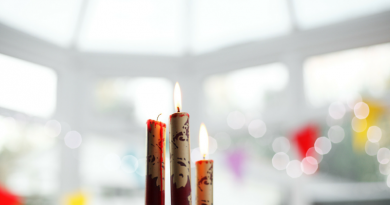 This might seem overwhelming at first but when broken down into simpler steps you can do it, too! Find out the basic shape. Is it a stole, a triangle, a crescent shawl? Almost all shawl shapes can be worked in more than one way. As soon as you find out the underlying construction method you can start resizing the shawl to fit your size. If you don’t know where to start, get some paper and a pen and try to understand the underlying construction. How are the increases worked? Are short rows involved? What about stitch pattern repeats? Try to compile a sketch of each pattern section and find out how it is constructed. As soon as you have worked this out, go and have a look at the main post and see if your shape is listed. If yes, proceed to this article and read about how to adjust this particular construction method. If it is not listed, have a look at Shawl Design for Everybody or consult Shawl Design in Plain English to find out more about the shape and construction method. The next and final step is to resize the actual pattern. Follow the instructions for the shawl shape identified as outline above to do so. 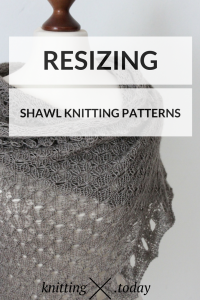 Now let’s talk about an example for resizing shawl knitting patterns to get you started! I wrote an extensive introduction to stitch pattern modules in knitting patterns in part one of this series: What Makes a Shawl Adjustable? Please consider reading this resource first if you haven’t done so already. A deeper understanding on these pattern modules and how they work together in shawl construction is essential to understand the underlying principles of combining stitch pattern modules in shawl design, especially when it comes to adjustable shawls. 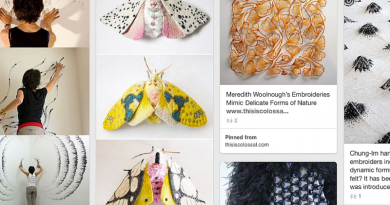 Try to get an overview about the stitch pattern modules used. Of how many columns and rows does each module consist? How are repeats being handled? Assume your existing pattern has got two different pattern modules: one 5 x 10 and one 10 x 10 module. Usually, shawl patterns are divided into sections, each one consisting of a certain combination of stitch pattern modules. Try to identify the sections in the existing shawl pattern you want to convert into a pattern for an adjustable shawl and take notes on which pattern modules are used in each section. One 10 x 5 repeat of the smaller module (5 x 10 stitches). The first section therefore consist of (5 x 3) x (10 x 10) = 50 x 30 stitches (50 stitches, 30 rows), the second one of (5 x 10) x (10 x 5) = 50 x 50 stitches (50 stitches, 50 rows). Having an overview about pattern modules and their usage in the different pattern sections now enable you to convert the static pattern stitch count into a dynamic (adjustable) one: we can redefine the number of repeats per pattern module for each section. Example: we would like our shawl to be 60 stitches instead of 50 stitches wide. In this case, we need ten stitches more in each row: one more repeat of the 10 x 10 pattern module in the first section and two more repeats of the 5 x 5 stitch pattern module in the second section. The same principle ca be applied to the height (length) of the shawl pattern: we can redefine the number of repeats row-wise and resulting in a different shawl length. If yes, feel free to drop me a comment! I’m looking forward to hearing from you and learning about your experience in resizing shawls and making shawls adjustable. I want to adjust a triangle shawl knit with increases at the edges and on either side of the center stitch, with eyelet rows separating the t main sections, so that the triangle is more shallow and the side parts of the “stripes” are wider than at the back. I assume this would require short rows at either side, to increase the width of the “stripes” on a gradual basis, but am not sure how to calculate where to place the short row turns. Honestly I don’t quite get your question. Would you mind sharing a sketch of your idea? The best place would be our free Facebook group called Shawl Knitting. Link is in the main menu. Thanks!